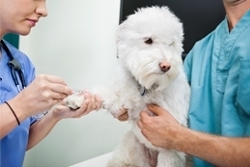 On a regular checkup appointment for your pet, your vet may suggest running a set of routine blood work tests. If your pet is seemingly in full health this may come as a surprise, but in reality, routine blood work is a valuable tool used by veterinarians everywhere to give them a fully detailed perspective on the overall health of your pet. Our beloved pets cannot speak for themselves. Routine blood work, best paired with a urinalysis test, is one of the best ways that veterinarians can gain a wealth of insight into not only an animal’s current health status but also their propensity for future problems that cannot be found on a physical examination. The price of routine blood work can be off-putting when your pet doesn’t seem ill but this is, in fact, the best time to perform the tests. All animals are different and obtaining a baseline result to compare future tests to improves the test’s overall efficiency. Where the real value of the service applies, however, is in its ability to provide early detection of conditions, giving vets and pet owners the best chance to successfully treat or manage the coming problems. Early detection and action is key, as in many cases it can significantly minimise the damage to a pet’s health and improve quality of life. So what does routine blood work involve? Testing an animal’s blood sugar can indicate an onset of diabetes, a condition not restricted to humans. This result is most accurate when paired with a urinalysis test. Elevated levels of protein in the blood can be indicative of dehydration or illness, suggesting that the immune system is working very hard. Conversely, low proteins can be telling of an immune system that is not healthy or working as it should be by not producing antibodies. High calcium levels in the bloodstream can be a sign of cancer or chronic kidney failure. Some poisons and glandular malfunctions can also be noted through an abnormal level of Calcium in the blood, high or low. Phosphorous levels in the blood are a common indicator of kidney health, with elevations indicating significant kidney damage. Increases in creatinine levels can indicate a host of issues, most commonly kidney disease and dehydration. Blood Urea Nitrogen (BUN), shows the levels of nitrogen in the bloodstream that is a result of the waste product urea, measuring kidney function. An increase in BUN can also indicate heart failure and dehydration, while a lower level can mean liver damage or failure. Higher than normal levels of alanine aminotransferase (ALT), mean that a damaged liver is leaching too much of the enzyme into the bloodstream. High levels of alkaline phosphatase (ALP), is also a frequent indicator of liver disease, but also bone disease. For more details about routine blood work or to book your next checkup, talk to your veterinarian today.